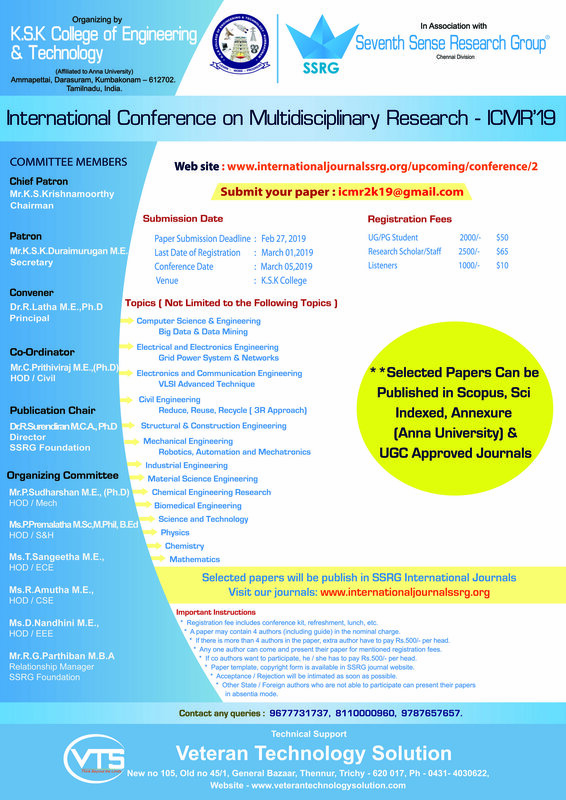 The aim of ICMR-2019 is to bring the research domains in Engineering, Science and technology on a single platform. This conference will bring the research communities of different fields together at one place to share their research and ideas. The main purpose of this conference is to incorporate interdisciplinary research to bring out best applications. The Airavatesvara Temple is a great masterpiece located in the Thanjavur district of Tamil Nadu. Constructed during the rule of the powerful Cholan dynasty, this majestic place of worship is present in Dharasuram quite near the temple town of Kumbakonam. A temple dedicated to Lord Shiva, this was built under the ruler Rajaraja Cholan back in the 12th century. It has been named Airavatesvara after the white elephant which is the vehicle of Lord Indra. The elephant is said to have worshipped Lord Shiva at this location in order to regain its white color after having suffered a curse from Sage Durvasa. This legend led to the naming of the temple as such. Moreover, this location is also believed to be the spot where Lord Yama prayed to the prime deity to get rid of a burning sensation all over his body which he was cursed with. This beautiful and serene location with its historic significance is definitely a place to be visited. At a distance of 2.5 km from Kumbakonam Railway Station, Adi Kumbeswarar Temple is a famous Hindu temple located in the center of Kumbakonam in Tamil Nadu. This temple is considered to be the 26th Paadal Petra Sthalam in the Chola kingdom that spread south of the River Cauvery. Adi Kumbeswarar Temple, also known as Thirukudamooku, is dedicated to the Lord Shiva, and was built during the Chola dynasty in the 9th century, while the temple was renovated by Govinda Dikshitar, the Chieftain of Achutha Nayakar of Thanjavur in the 16th century AD. The temple is maintained and administered by the Hindu Religious and Charitable Endowments Department of the Government of Tamil Nadu. The tank covers an area of 6.2 acres and is trapezoidal in shape. The tank is surrounded by 16 small Mandapams (shrines) and has 21 wells inside the tank. Govinda Dikshitar, the chieftain of Ragunatha Nayak of Thanjavur, constructed the sixteen Mandapams and stone steps around this tank. Brahmatheerthesar, Mukunthar, Thalesar, Rishakesar, Umaipakesar, Nairuthesar, Brahmeesar, Gangatheerthesar and Seshtra Paleesar, are the names of deities located in these Mandapams. At a distance of 2 km from Kumbakonam Railway Station and 500 m from Adi Kumbeswarar Temple, Sarangapani Temple is a Hindu temple situated in Kumbakonam. The temple is dedicated to Lord Vishnu. Sarangam means bow and pani means hand. The deity is having a bow in the hand. Also known as Tiru Kudanthai is the third of the 108 Divya Desams. The Sarangapani Temple is also one of the Pancha Ranga Khestras with the other four being Srirangapatnam, Srirangam, Appalarangam, Parimala Ranganatha Perumal Temple at Mayiladuthurai and Vatarangam at Sirkazhi. The Sarangapani Temple existed during the Pallava period. However, the current structure is attributed to the period of Vikrama Chola (1121 AD onwards) and it was renovated in 16th century during the period of Nayaks. The temple is believed to be constructed by the Medieval Cholas of the late 8th century AD, while later contributions made by Thanjavur Nayaks. The temple has two inscriptions dating from the Chola period. According to mythology, Lord Oppilliappan married Bhoomidevi here. The Lord came in the form of an old man and asked Markandeya to give his daughter Bhoomidevi in marriage to him. Markandeya said that his daughter was too young to cook food and that she did not even know how to use salt in cooking. To this the Lord said that he would accept the food even without salt. Hence the Lord gets the name Uppiliappan and salt is not added in the prasadam prepared in the temple. The temple was constructed in Dravidian style of architecture. It has a five-tiered Rajagopuram. Lord Vishnu is worshiped as Uppiliappan and his consort Lakshmi as Bhoomidevi. The 8 feet tall idol of the Lord with Bhoomidevi on the right and Markandeya maharishi on the left was appeared in the main sanctum. The Utsava deity Oppiliappan is never taken out of the temple without his consort Bhoomidevi, since he had promised Markandeya maharishi that he would never leave his daughter Bhoomidevi alone while asking her hand in marriage. Dedicated to Lord Shiva, the temple complex is one of the largest temple complexes in Tamil Nadu. The present masonry structure was built during the Chola dynasty in the 9th century, while later expansions are attributed to Thanjavur Nayaks during the 16th century. There are 149 inscriptions associated with the temple indicating contributions from Pandyas, Cholas, Thanjavur Nayaks and Thanjavur Maratha kingdom.The temple has a five-tiered Rajagopuram and three precincts, each enclosed inside huge walls and having gateway towers for each of them. The temple is rectangular in plan with East-West orientation and has four entrances in each of the four directions. The three precincts are called Aswametha Pradakshina, Kodumudi and Pranava. Pranava precinct has lot of sculptures dating back to the Nayak period of the 16th century. This temple is dedicated to Lord Rama, an incarnation of Lord Vishnu. Achutha Nayaka of Thanjavur constructed the temple during the 16th century CE. The temple was built in Dravidian architectural style. This temple consists of one Gopuram, one Maha Mandapam and Sanctum Sanctorum. The columns of Maha Mandapam are enriched with some of the famous stone carvings of Vamana Avatharam, Meenakshi Kalyanam and Sugreeva Pattabishekam. The outer Prakaram consists of 219 wall paintings, which explains the series of incidents from the great Epic Ramayana.